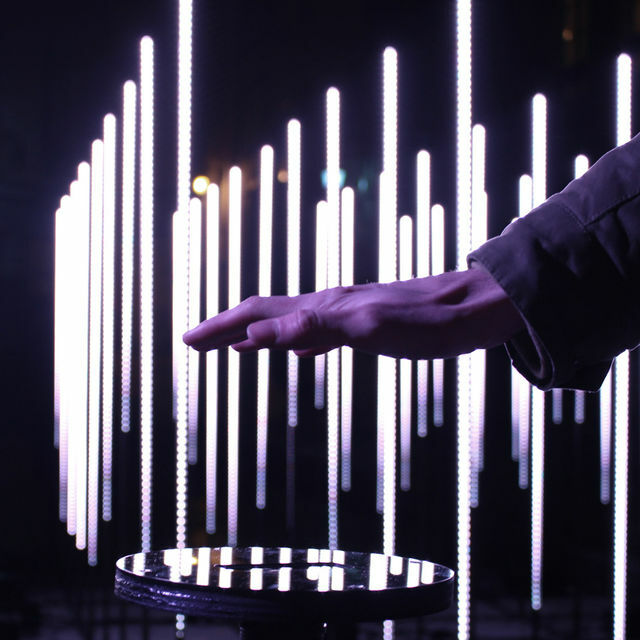 One hand movement and a whole light field changes form: that is the key to this installation. The shape and movements of an onlooker’s hand are caught by a sensor and take shape in the space, by means of illuminated rods. In this way, a gesture becomes a visual, visible and tactile effect, providing a fleeting, unique geology of movement. Passers-by get the chance to try out a gesture and marvel, along with onlookers, at the waves of light that they themselves have created. This is a playful and interactive installation that will fascinate young and old. Artist : Studio Chevalvert (https://chevalvert.fr/). Contributors : Stéphane Buellet, Arnaud Juracek, Patrick Paleta & Julia Puyo Calvo.